Going Bananas…In A Good Way!!! 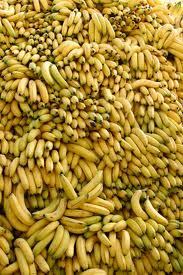 I think I throw out about a million bananas a year. If I don’t throw them out right away…I freeze them for smoothies and then when I don’t have room in the freezer for something else…I throw them out anyway. There is almost nothing I can do with an old banana. Birds don’t eat them. They are not pretty to look at. And yet they sit on my counter in a pretty bowl and just sort of die there. I really only like to eat a firm banana. And I really only like to eat a small banana. And also…never ever in my entire life have I ever bought just the right banana. Monday morning found me staring at about 6 very brown looking bananas. And it did not help to have my husband tell me that he ate one and it tasted just fine. Ick!!! Double ick!!! However…today…I conquered my banana dilemma. I made a yummy delicious looking banana cake…an easy recipe from allrecipes. However…there are two of us and this cake looks huge…what am I going to do with all of this banana cake? I Love Setting Goals For Other People…Especially My Husband. I could come over to have a piece. It looks yummy! I just made the icing…so you are more than welcome plus I used up 4 bananas!!! That is the best part.